LOCATION.--Lat 39°06'39", long 74°44'03" referenced to North American Datum of 1983, Avalon Borough, Cape May County, NJ, Hydrologic Unit 02040302, on fishing pier at east end of Old Avalon Boulevard, 0.5 mi east of bridge carrying County Route 601 (Avalon Boulevard) over Ingram Thorofare, 1.0 mi west of Avalon, 1.0 mi southwest of Townsends Inlet, and 1.6 mi east of Upper Island in Great Sound. NOTE: The pier and well have a fence surrounding them since the pier was closed as of August, 2016. The well can still be accessed. PERIOD OF RECORD.--Continuous-record tide gage, October 1977 to May 1978, May 13, 2000 to current year. Annual maximum tide, water years 1979 to 1981, 1984 and 1993. Unpublished fragmentary gage-height record, May 1997 to May 2000. GAGE.--Tide elevation and water temperature recorder with telemetry and tidal crest-stage gage. Datum of gage is at 0.00 ft NAVD of 1988. 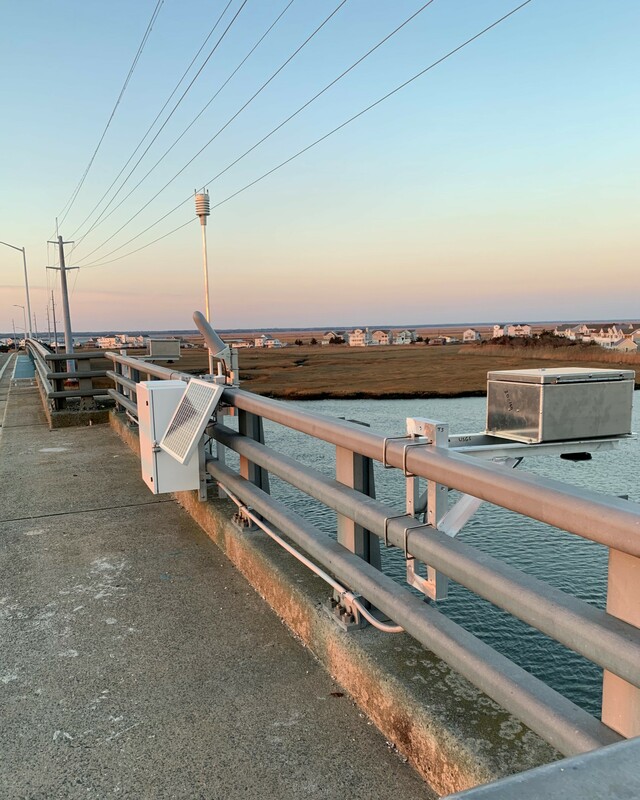 To determine approximate elevations to NGVD of 1929, add 1.29 ft. From October 1977 to May 1978, tide level recorder located 200 ft south of current station and datum of gage at 0.00 ft NGVD of 1929. From 1978 to 1981, tidal crest-stage gage located 200 ft south of current station and datum of gage at 0.00 ft NGVD of 1929. Data published to NGVD of 1929 can be adjusted to NAVD of 1988 by subtracting 1.29 ft. Online annual tidal peaks have been adjusted to current datum. REMARKS.--Gage cannot measure tide elevation below -4.15 ft or above 3.85 ft. Tide elevations below -4.15 ft and above 3.85 ft have been estimated. Periods of missing data are noted by dashed (---) lines. EXTREMES FOR PERIOD OF RECORD.--Maximum elevation, 7.15 ft, from crest-stage gage, Oct 29, 2012; minimum elevation, undetermined, likely occurred Feb 17, 2007 as indicated by nearby reference gages.